I have not posted in a long time....it's actually been almost a year. I'm a teacher and during the school year, meals tend to be quick and not blog-worthy. It's usually something I throw together with no measuring or recipe involved. I cook something and we eat. During the summer, I get a little more creative and try new recipes. There is something I have been thinking about blogging for quite a few months. 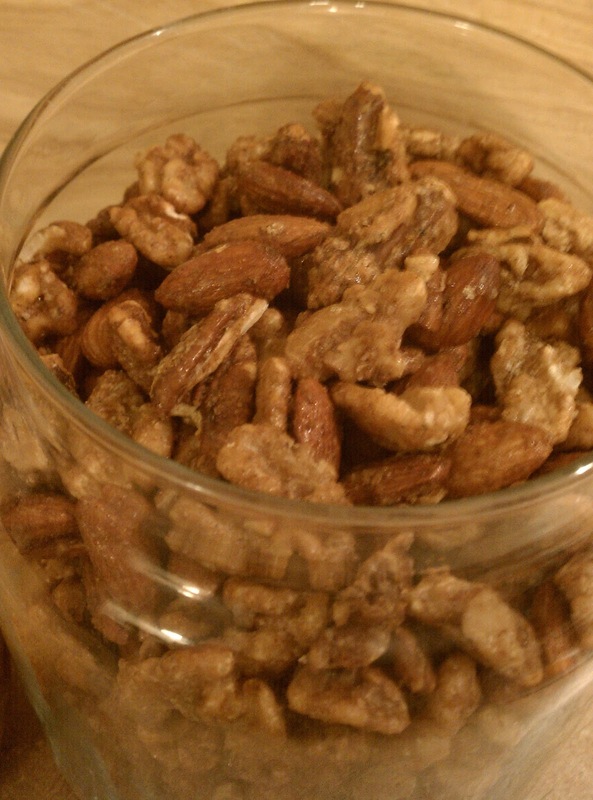 It's a recipe I put together after trying some that I found online - roasted spiced nuts. This recipe came from my need to use up a supply of almonds and cashews that I had. I was tired of eating them raw and wanted something sweet and spicy. It is a super-simple recipe and can be adapted many different ways with a variety of spices, extracts and nuts. They are versatile, also. We eat them as-is, on ice cream, and my favorite, on salads. My next experiment will be to put them in a chocolate chip cookie recipe. Preheat oven to 275 degrees. Cover a large cookie sheet with sides with non-stick foil. In a large bowl, beat the egg whites and vanilla until foamy. In a small bowl, mix the Splenda, brown sugar, salt and spices. Add the nuts to the large bowl with the egg whites and mix thoroughly until all the nuts are coated. Add the sugar, salt and spice mixture and stir gently to coat all the nuts. Spread the nuts into the pan. Bake for one hour, stirring every 20 minutes. Let cool completely and store in air-tight container for up to two weeks. Back to School - Be Back Soon! Well, it's that time of the year. Teachers had to be back at work yesterday and students come next Monday. This week is full of meetings, training and getting ready for kiddos. I will start posting again as soon as I get some time and I actually cook something blog-worthy (which hasn't been happening much lately). One of my favorite pasta dishes is chicken or shrimp alfredo. It is rich and creamy and full of fat and calories. I've been working on my own recipe for a healthy version of this dish but haven't quite mastered it yet. When I came across this recipe on The Gracious Gourmet I didn't believe it could work. There was no way it could be this easy and delicious. The secret to Tiffany's recipe is cottage cheese. Yes, cottage cheese. To tell the truth I had never tried cottage cheese until this past week. The texture of it has always turned me off. I have a feeling there are a lot of people that feel the same way. I was brave and tried it. Believe it or not, it is really good. It tastes like little bits of cheese in tangy cream. I'm going to have to do some more research to find out how it is good for you. It doesn't really taste like it should be. This sauce couldn't be any easier. It turns out to be thick and rich and it's a very good option if you are watching your wasteline. This made a lot of sauce so you may want to half the recipe. Now, I just need to come up with another use for the leftovers. Combine all ingredients in a saucepan. Heat until the mixture warms and bubbles for about 5 minutes. Transfer the warm mixture to a blender or food processor. Process until the mixture becomes smooth. Add a little more milk if it is too thick. Pour back into the pan and heat until hot and bubbly. Add salt and pepper to taste. Pour over cooked pasta. Add some grilled chicken and steamed broccoli if desired. Several months ago, I found a food blog that combined two of my passions, reading and cooking. The blog is Cook the Books. Each month one of the hosts, Rachel, Debbie or Jo chooses a novel that is entwined with food. 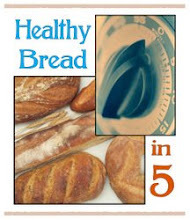 Those that choose to participate read the book, cook something inspired by the book and then blog about it. 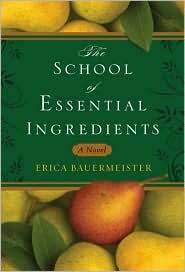 This month's book was The School of Essential Ingredients by Erica Bauermeister. This is a heart-warming story about a group of people that come together on Monday nights for a cooking class at Lillian's restaurant. Through cooking, food and each other, these individuals find passion, hope and friendship. The characters and story made me feel many different emotions as I was reading. The most prevalent emotion was envy. I know, crazy right? Well, I would love to have an opportunity like these characters had. A cooking class by a professional chef and restaurant owner. Wow! I have taken one cooking class before (one night only) with my sister in law and it was such a great experience that I will remember forever. I still make the recipes I learned from that evening. So, my contribution to this month's Cook the Books is a White on White cake. I loved the way the author described the cake and all of its simplicity in the story. To tell you the truth, I had trouble with this simplicity when I was making the cake. When I bake, I like to go "all out". If I'm going to bake something this unhealthy then it's going to be full of vibrant flavors and ingredients. I wanted to put lemon curd between the layers. I wanted to add something because it was just going to be white and vanilla flavored. Sounded pretty boring to me. Needless to say, I restrained myself so it stayed true to the white cake with white icing as in the story. I did add some lime extract to the icing, though. I needed some more flavor. I know...I'm weak. That's okay. It turned out incredible. and beautiful! The recipes come from Cake Love by Warren Brown. The cake is a white butter cake and the icing is an Italian Meringue Buttercream. I will be posting the recipes in a couple days. We decided to take a last minute road trip to St. Louis this weekend so I will be adding the recipes when I get back. These are some of the most tasty cookies I've ever made. They aren't healthy in any way, but I like to splurge a little sometimes. These are definitely worth it! Combine flour, baking soda, and salt in a small bowl. Cream butter and sugars until light and creamy. Beat in vanilla and egg until smooth. Gradually add flour mixture until combined. Stir in orange zest and chips. Drop rounded teaspoons onto ungreased cookie sheets. Bake 8-10 minutes or until golden brown around the edges. Cool for several minutes on the cookie sheets before transferring them to cooling racks. Tacos are one of my fast and easy "go to" meals. I have always used ground beef until I recently tried cooking a beef chuck roast in the crockpot for my taco meat. Check out the Tacos de Barbacoa recipe here. I wanted to use the same concept but with a different spice rub. I chose Bobby Flay's 16 Spice Rub. I made this spice blend a while back and still had a lot left. It was perfect for this meal. I know 16 spices looks a little intimidating, but many of them I already had. You could use any spice mixture that you want and still make these enchiladas. But, I challenge you to make the 16 spice rub sometime. It is really delicious. It has some heat but also some warm and earthy flavors from the allspice, cinnamon and cloves. I made this recipe up as I went along. I don't post many of the meals that I make simply because they are usually just thrown together. I had a good feeling about this one so I actually wrote things down as I cooked. My husband was skeptical when he walked in the kitchen and the enchiladas did not look like the usual covered-in-cheese-and-meat ones we have cooked for the past 15 years. These were plain on top. I decided to bake the enchiladas without sauce on top because I knew the salsa I planned on using would make them soggy as they baked. They were not filled with the old standard meat and cheese of the old days. These were filled with shredded beef, onions, peppers, a little sour cream and cheese, and guess what...zucchini. Yes, zucchini. I've learned that zucchini can be a great filler and make a meal go a lot farther. AND add some nutrition. They don't have a lot of flavor so they are perfect for this. These enchiladas are stuffed full, but not with a lot of fat and bad-for-you stuff. These enchiladas were a hit! My husband even apologized later for judging and jumping to conclusions before he had eaten them. WOW! (That doesn't happen too often and it made me feel good). He ate them for lunch the next day and said they were great reheated, too. The roast that you cook is enough for two meals. I made tacos one night and these enchiladas the next night. In a small bowl stir all spices together. Rub on all sides of the roast; rub in with your fingers. If you can, put it in the refrigerator for a while (I let it sit for about 2 hours). Place in a 5 to 6 quart slow cooker with broth. Add sliced onions on top of the roast. Cook, covered on low-heat setting 10-12 hours or until tender. (I cooked mine for about 8 hours and it was perfect). Preheat oven to 350F. Heat a large nonstick pan to medium high heat. Add olive oil. Add onions, zucchini, and peppers. Cook for about 7 minutes or until the onions start to turn translucent. Stir in the garlic and cook for about 2 minutes. Add salt and pepper to taste. Remove from heat. Stir in cheese and sour cream. Set aside. Cover two cookie sheets with foil or spray with nonstick spray. Lay out tortillas on the pans in a single layer. Spray lightly with cooking spray. Place pans in the oven and cook for about 4 minutes. Spray a 13x9 baking dish with nonstick spray. Spread about 2 tbsp of zucchini mixture on one of the warm tortillas and add some of the shredded taco meat. Roll up the tortilla and place in the pan seam side down. Repeat with the rest of the tortillas. Cover pan with foil and bake for 30 minutes. Serve the enchiladas with warm salsa on top. I have linked up this post to Just Something I Whipped Up at The Girl Creative. These are delicious! I could eat a whole tray of them. I added a little spin to the ones I usually cook by including some fresh oregano and garlic. Preheat the oven to broil. Mix the cream cheese, oregano and garlic together in a small bowl. Stuff the peppers with the cheese mixture and top each with a piece of cut bacon. Place peppers in a greased pan and broil until the bacon is cooked. Serve warm. I am a kindergarten teacher living in Kansas, though my heart will always be in Texas. I spend my "extra" time cooking, baking, reading, planning for my classroom and spending time with my son and husband. My newest obsession is Zumba. I have been teaching since October and absolutely LOVE it!!! My twelve-year-old son, Cameron loves to cook with me and has considered being a chef when he grows up. We spend a lot of quality time together in our teeny-tiny kitchen.